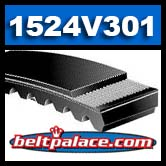 1524V301 Multi-Speed Belt. Industrial Grade. Length 30.6” O.C - Top width 15/16" - Angle 24. SPECIAL PRICE WHILE SUPPLIES LAST! ABOUT (8) LEFT IN STOCK. 775VA2424 VARIABLE SPEED, Bando Power Max 1524V301. GATES, BANDO, BROWNING, JASON, SPEED CONTROL 1524V301 Belt. COMET 300619, Comet Industries belt replacement for 500 Series, 704036 Go Kart belt. Comet 300619(A-DF) Go Kart Belt is an exact replacement for Comet Industries belt 704036. Replaces OEM Comet 500 Series torque converter belt. Measurements: 0.92 Inch Width, 30.4 Inch Length. Symmetric Cogged belt. 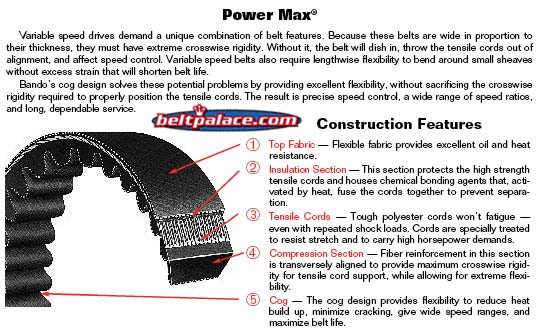 A popular size ATV belt, Go Cart belt, Golf Cart drive belt, People Mover clutch belt, and Mini-Bike drive belt.